Dreams & Notes...: Prague in "Summer"
Our first day, we lucked out as K's class was going on a field trip, and they let us tag along! The field trip was to a city called Kutná Hora, about an hour away by car. It was a quaint little city that got its start with a monastery, but quickly grew because silver was discovered. On the left is St. Barbara's Street with the church we visited in the background. On the right is one of the rainy cobbled streets we took to get to the restaurant where we ate lunch. 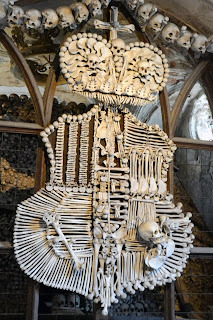 After Kutná Hora, we went to a small town close by called Sedlec, which has an infamous Ossuary and is one of the most visited attractions in the Czech Republic. This building houses the remains of about 40,000- 70,000 people, whose bones have been arranged in an artistic manner. Most of the bones date back to the black plague and the Hussite wars in the 14th and 15th centuries. there is a raven pecking out someone's eye. When in Prague, we stayed in a hotel very close to the city center, and just around the corner from the apartment where K was living. In a five minute walk we were in the Old Town Square, that holds an astronomical clock- one of the most beautiful clocks I've ever seen. The man who designed the clock was blinded when he was finished so he couldn't make another clock like it. Then, as revenge, he threw himself into the clockwork so the clock was broken for many years before someone was able to fix it again. that I bought a miniature version to bring home! Views from the top of the Old Town Hall tower. Týn Church is an excellent example of a Gothic church, built in the 14th century. The most interesting part of this church is that the front is covered by buildings in front of it. The main entrance is behind the buildings, and there is a narrow opening between them to get to it. We climbed up to Prague Castle, but got confused and only visited the St. Vitus Cathedral. The castle is the largest ancient castle in the world, but it's more of a complex and not just one building. Since it was raining and we didn't know what parts of the castle to go visit, we stopped for a beer at the Klasterni Pivovar Strahov or The Strahov Monastery Brewery. The name is pretty straightforward, but it's a microbrewery housed in ancient monastery buildings from about 1100. We thoroughly enjoyed the beer too! The Charles Bridge is the oldest bridge in Prague, and was originally the only connection between the Prague Castle and the Old Town. It was finished in the 1400's and displays beautiful Gothic guard towers on either end. It is also lined by statues which were put there for decoration much later. Prague Castle and the Charles Bridge The infamous "dancing houses"
The Jewish Quarter in Prague was originally the Jewish Ghetto but was mostly demolished in the late 1800's because they wanted to rebuild the city using Paris as a model. The only remains are 6 synagogues, the cemetery, and the Old Jewish Town Hall. Now it is preserved as the Jewish Museum in Prague. The Old New Synagogue, which is the oldest active synagogue in Europe. On the right is the Jewish Town Hall, which has two clocks. The one on the tower has Roman numerals and the second one has Hebrew numbers. The Old Jewish Cemetery is the oldest Jewish Cemetery in Europe. The oldest gravestone is from 1439 and there are over 12,00 tombstones, but they think there are many more bodies. The buried bodies are layered and they have had to bring in more dirt to allow space for more burials. Also...Follow my blog with Bloglovin! I've just started using this site to organize the blogs that I read and I like it!